I put one of these baskets on the back of my Scoot but soon removed it. It was hard to put things in it because the seat blocks the access to it. And it was hard to remove and reinstall the batteries because the basket was in the way. 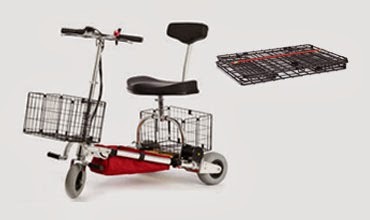 I have a Peterboro basket on the front but am thinking about removing it and putting this folding basket on the front to facilitate storing my Scoot.